Portrait of Brunel by Robert Howlett. Brunel is standing in front of the stern checking drum on his steam ship the SS 'Great Eastern'. 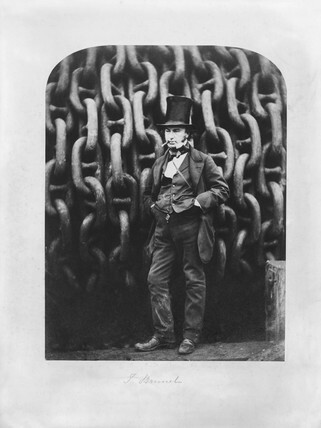 Brunel is one of the best known engineers of the nineteenth century. As well as ship building he was responsible for building the Great Western Railway and building bridges such as the Saltash Bridge in Cornwall and the Clifton Suspension Bridge in Bristol. Isambard Kingdom Brunel, English railway engineer and inventor, 1857. Stereoscopic photograph of the Moon, c 1855.